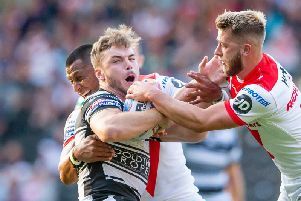 WITH statistics that read three tries, seven tackle busts, 102 metres made and two clean breaks, it is safe to say Hull FC’s Josh Griffin enjoyed his latest return to former club Salford Red Devils. The crucial stat’ missing, of course, is the most important: that being one crucial, timely win. Griffin, the striding centre who has crossed seven times in his last nine games, was at his purposeful best in Sunday’s 23-16 victory. However, after his treble blast against the side he left in 2016, he was the first to admit, securing a victory was all that mattered. Hull had been embarrassed 63-12 at home the previous week but, despite missing plenty of injured personnel, responded with a far more edifying display to move up to joint-fourth in Super League. “We’re happy with that; we needed a performance after last week and thankfully we got it,” Griffin told The Yorkshire Post. “Salford are a great side. They are around us in the table so we needed to knock them off and to score a hat-trick against my old team was the icing on the cake. “It was massively important we won. We said Warrington was a slip-up. (But) a lot of boys had to look at themselves in the mirror this week, really dig deep and believe we could come out and get a performance. Griffin scored 30 tries in 43 games during three years with Salford before moving to Hull and lifting the Challenge Cup in his debut season at the East Yorkshire club. A lot of boys had to look at themselves in the mirror this week, really dig deep and believe we could come out and get a performance. Set to turn 29 next month, the former Wakefield Trinity, Huddersfield Giants and Castleford Tigers player is fast becoming one of their most experienced campaigners. It was someone at the other end of the spectrum, though, who quietly caught the eye almost as much as Griffin; at just 18 years-old, full-back Connor Wynne looked remarkably assured on his Super League debut with Hull. “He’s a great little player who’s going to be around for years,” admitted Griffin. “He was very confident on his debut and under the high ball. He pulled up a couple of times with cramp but that’s just the intensity and step up to Super League. “But it was an outstanding debut and he’s a good young kid. Jack Logan will hope to retain his squad place for the trip to Perpignan having made the most of a surprise chance at Salford. The outside-back had been on loan with Championship leaders Toronto Wolfpack but was recalled by his injury-hit parent club last week and started on the wing at AJ Bell Stadium. Logan is now looking to put himself in the “shop window” and admitted: “It’s good to obviously get the win. “I’ve been on loan at Toronto for the last four weeks which was a really good experience. “It was quite unexpected the call-back, if I’m honest. I felt I was going strong at Toronto and obviously the boys were going strong here, too. But a couple of injuries have meant there’s been not many outside backs up for selection so I didn’t really have the choice. Academy product Logan, 23, has struggled to cement a spot with his hometown side, his progress with Hull being slowed after rupturing an anterior cruciate ligament in June 2016 that kept him sidelined for a year. He made a dozen appearances last term but none after July with his last six appearances of the campaign coming at League 1 Doncaster. Logan added: “I’m happy playing wherever, whether at centre, on the wing or spells at full-back. “I’m out of contract at the end of this year and this a massive opportunity for me to put myself in the shop window for clubs who may not have seen me play yet. Asked if has been told definitively whether he will be staying at the KCOM Stadium in 2020, Logan replied. “No. I’m open to anybody or anything who comes up to me at the moment. It’s getting to the time when you really have to start thinking and knuckling down to get some security in the game. 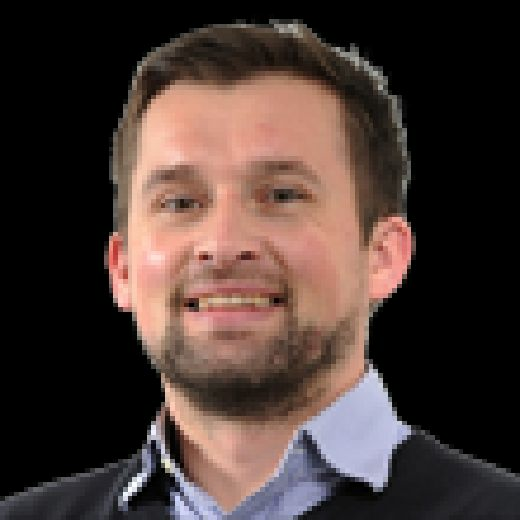 Hull were missing wingers Ratu Naulago and Fetuli Talanoa, plus England centre Jake Connor and full-back Jamie Shaul at Salford, so it’s understandable why Logan was recalled. But they will now also be without forwards Mickey Paea and Andre Savelio for the Catalans match after they received one-game penalty notices for raising a knee and tripping respectively. Hull captain Danny Houghton was also charged with a Grade A trip but not suspended.